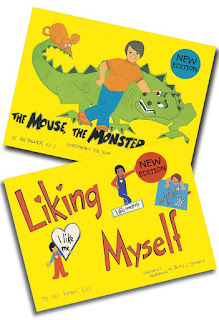 I recently had the opportunity to review to wonderful books: Liking Myself by Pat Palmer, illustrated by Betty L. Shandeck and The Mouse, The Monster, and Me by Pat Palmer, illustrated by Betty Shondeck. These books are written for kids, I'd say five and up, but teach valuable life lessons to all ages. I think they are a must for any family, no matter how old your kids are. Liking Myself teaches us that it is indeed okay to like ourselves. I know a few adults that need to read this little treasure. It is all about self worth and self approval, something you do not find too often in children's books. The Mouse, The Monster, and Me is about learning to be yourself. It explains that you do not want to be a mouse, a meek little thing that everyone walks all over. But, you don't want to be an aggressive monster, snapping at everyone for every little thing either. This book helps you find the balance and yourself. Both a written with hand lettered pages, much like a child's handwriting which really appeals to kids. The illustrations are simple but very cute. The books are written in simple language so they are easy for children to understand. I would have loved having these books in my preschool classroom and am so thrilled to now have them in my home library! They would make a great gifts for the special kids in your life. Keep them in mind this holiday season. Also, be sure to check out the website, which is currently offering free teacher's guides for the books. These are such great books for teachers or anyone who works with kids. Go check it out!